William Sansom was a talented writer, journalist, amateur actor and member of the Auxiliary Fire Service (AFS) based in the City of Westminster during the Blitz. Service as a volunteer fireman during 1940-1941 affected him profoundly. He reflected this in a series of vividly-written short stories and non-fiction pieces, most particularly in his anthology ‘Fireman Flower and Other Short Stories’ (1944) and in his classic narrative history account, ‘The Blitz: Westminster in War' (1947). Compared with the Czech novelist Franz Kafka for the visceral nature of his writing, Sansom had an unerring ability to convey both endurance and nightmarish detail. Born in 1912 and educated at Uppingham School, Rutland, Sansom initially studied German in Bonn before working in London in banking and advertising in the 1930s. After the outbreak of war Sansom joined the Auxiliary Fire Service (AFS) as a civilian fireman based in Westminster. The AFS, formed in 1937 as part of the Civil Defence Act, was a volunteer force of 89,000 men (23,000 in London) and 6,000 women trained in fire-fighting duties in the capital and in eighteen provincial cities across Britain. New recruits included poets and artists (including Stephen Spender and Leonard Rosoman), writers (among them William Sansom) and a number of conscientious objectors. During 1939-1940, the AFS was still a largely untried force. Eighty percent of AFS members had limited training and had never tackled a serious fire. Tensions between AFS volunteers and their regular Fire Service colleagues simmered as the former made mistakes as they gained experience. The regulars often referred disparagingly to the volunteers as ‘army dodgers’. Morale and training in Britain’s fire services were thus worryingly deficient when the Blitz arrived on 7 September 1940. Nevertheless, 28-year-old AFS fireman William Sansom and his colleagues soon found themselves fighting fires deep in the inferno. On Sunday, 29 December 1940, in one of the heaviest raids of the London Blitz, German bombers dropped over 20,000 incendiaries and 120 tons of high explosive bombs on the City of London. Their targets were the business sectors surrounding St Paul’s Cathedral and the newspaper district in Fleet Street, EC4. Their intention was to devastate London’s economy and the symbols of its history and identity. From 6.30pm that night, Westminster's Fire Control Centre became a scene of intense activity. As reports of over a thousand fires were telephoned in from the City of London's five other Control Centres, Westminster operators dispatched every fire crew available in support. Just before 7pm, the Control Centre sent a three man AFS reinforcement crew to investigate reports of fire spreading on roofs in Shoe Lane, just off the eastern end of Fleet Street EC4. Today, Shoe Lane hosts the glass offices of investment bank Goldman Sachs, but in 1940 it was a narrow alley of houses, newspaper offices and a vast Victorian book warehouse. The AFS team was formed by William Sansom, his close friend artist Leonard Rosoman (1913-2012), plus an additional colleague. They drove east from Westminster into the burning City, arriving at Shoe Lane at around 7.10pm. Owing to the serious shortage of fire appliances, the three men - like most other AFS volunteers – were equipped with a commandeered London taxi towing a single fire pump and hoses. They were confronted by the sight of the burning five storey book warehouse, whose bricks were already dangerously hot from the flames flickering hungrily inside. By 7.15pm, Sansom and his colleagues had deployed their hoses: the pump’s capacity was 500 gallons per minute. For the next three and half hours they tried to contain the fire’s progress. They were fighting a losing battle. Sansom later incorporated his experience at Shoe Lane into his fictional story, 'The Wall' (1944). With high explosive bombs falling nearby, and other incendiary fires converging, Sansom also recalled the eerie sound of the superheated brick walls, now close to cracking. At 1am a replacement fireman arrived and relieved Rosomon on the hose. As Rosomon moved to set up equipment in a nearby building, the walls of an adjacent house suddenly collapsed with a terrifying roar. Sansom managed to get clear at the last moment but their other colleague was killed by heavy falling brickwork. It was an incident that marked both survivors deeply. Rosomon – who became an official war artist in 1943 and later an academic, illustrator and exhibitor – captured the incident in his painting ‘A House Collapsing on Two Firemen, Shoe Lane, London EC4’ (1940, Imperial War Museum Collections). Shoe Lane epitomised the overstretched, underequipped working conditions of the AFS despite the heroism of its civilian volunteers. Acutely conscious of the equipment and morale issues, the government subsequently forged the regular and auxiliary fire-fighting arms into a single cohesive entity. In 1941, 1,600 local fire brigades were amalgamated into a National Fire Service (NFS). This new organisation was designed to address the realities of mass aerial bombing and ended the distinction between regular firemen and the former AFS. Nicknamed by Prime Minister Winston Churchill the ‘heroes with grimy faces’, the NFS formed a critical arm of Britain’s Civil Defence for the rest of the war. Popular films, featuring actual firemen, were also released to celebrate both AFS members and regulars and foster a spirit of new collective fire service identity. In 1943 - during a relative lull in the Blitz – William Sansom himself appeared as a piano-playing fireman in the film ‘Fires Were Started’ (a Crown Film Unit morale-boosting piece directed by Humphry Jennings). Sansom described his positive experiences making the film in Film Quarterly in 1961. 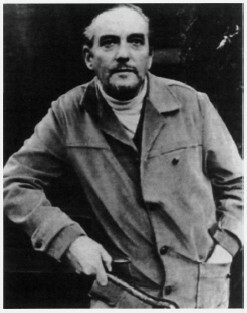 Post war, Sansom published several film scripts and became a prolific author. The Society of Authors awarded him prizes in 1946 and 1947 and the Royal Society of Literature elected him a Fellow in 1951. 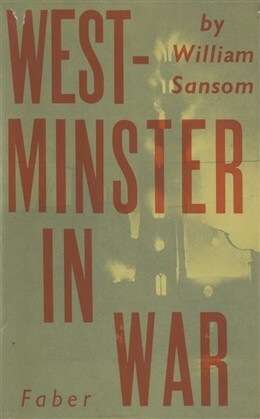 From 1944 to 1974, Sansom wrote fifteen novels, eight short story collections (including Fireman Flower and others with supernatural themes), six non-fiction pieces (including the highly-readable ‘The Blitz: Westminster in War’), dozens of travel books, articles and features, two children’s stories and one book illustration. William Sansom died in 1976. This page was added by Ronan Thomas on 14/10/2010. Great detail. I shall read Sansom's works. any chance of getting all or excerpts of his ledger of the Blitz incidents on this web site? (Please delete my initial comment of 19/6/17, as it contains an error in my evaluation of the matter.) Further research has revealed that, "A House Falling on Two Fireman, Shoe Lane, EC4" is the correct war title which the WAAC assigned to the painting (almost certainly with Leonard Rosoman's permission) in the Fall of 1941. It was acquired by the Imperial War Museum (IWM) under this title in 1947. However, it is clear from primary source documentation that Rosoman continued to refer to his work as, "The Falling Wall" (his given title), until he was into his nineties. On 22 June, 2017, through the assistant of Brian Frederick Foss, war art historian, I received an email communication from Claire Brenard, Curator, Art, IWM, in which she stated that the IWM catalogue entry is being revised to include the aka, "The Falling Wall". I believe that this change in documentation will serve to insure that the WAAC wartime title, and the artist's title, both survive.